Most people believe that having lots of money and not having to work for a living is a beautiful thing, but we know from studying lottery winners that this is often not the case. In many cases, a large inheritance is no different. 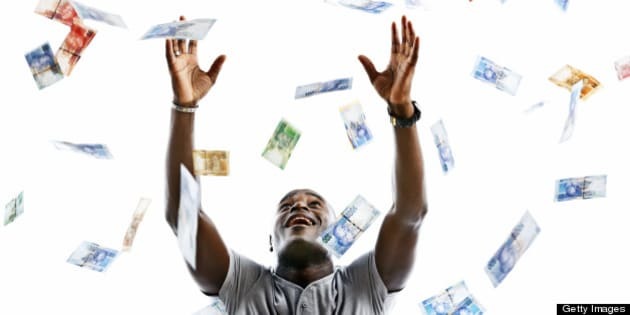 A happy man looks up smiling as he tries to catch hundreds of falling banknotes. The banknotes are varied denominations of the new South African currency featuring South African statesman, Nelson Mandela. Isolated on white. Are you ready for the $1 trillion giveaway? It's been estimated that baby boomers in Canada stand to inherit as much as $1 trillion over the next twenty years. So the question is: are you ready? According to studies, as many as 70 per cent of individuals who come into a lump sum of money (regardless of the amount) lose that money within the first few years. I always tell people, "Saving is a habit, investing is a discipline." Unfortunately, many people have neither the habit nor the discipline to handle money, especially large amounts. If you are the one giving the money away, you should consider each recipient. Are they really capable of handling the responsibility of the inheritance? Is it going to enhance their lives or is it going to destroy their lives? I've seen it happen both ways. Most people believe that having lots of money and not having to work for a living is a beautiful thing, but we know from studying lottery winners that this is often not the case. In many cases, a large inheritance is no different. If you're not sure your heirs can handle a large inheritance, you should consider leaving their share in a trust that can be managed by someone else. There are too many ways to set up trusts to explain them all, but a good trust lawyer should be able make recommendations based on your particular circumstances. The manager of a trust (called a trustee) decides what proportion of the income and principal is distributed to the beneficiary each year. If you want to give direction to the trustee (for example, direct the trustee to pay all the income of the trust out each year) you can do so in your Will. If you're the recipient of an inheritance, you should take your time before making major decisions. People often think having money will make their problems disappear. Unfortunately, it doesn't always work that way. It doesn't matter if you suddenly receive $100,000 or $10,000,000. Any amount can be lost and not always by your own doing. For example, what do Larry King, MC Hammer, Marvin Gaye, Kim Basinger, Wayne Newton & Mike Tyson all have in common? They all declared bankruptcy. It's estimated that Mike Tyson earned almost $300 million during his boxing career. Money is a tool that can make things happen, but like any tool, you have to learn how to use it.